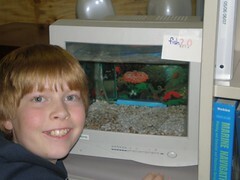 My classroom is home to a aquarium made from a converted monitor. After several months of fish-lessness, we finally received a new pet fish. His (her?) name is fish 2.0 and is (of course!) a beta fish. You can’t see him (her?) in the tank, probably because he’s been swimming around trying to get to the non-existent coral pictured at the back of the tank. fish 2.0 earned his name for several reasons. First off, he’s the second fish I’ve given a home to in this aquarium. Before he moved in, we had a few $0.29 Wal-Mart fish of unknown variety living there. They died last spring after 2 years of aquarium happiness. 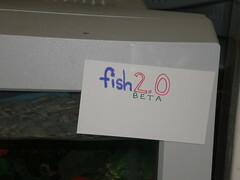 Second off, fish 2.0 is a beta fish. ‘Nuff said. ← Georgia State, Here I Come (on MARTA)!